Winter is hardly home improvement season, yet we often find ourselves finishing up our summer projects at this time as we prepare our homes for holiday parties. 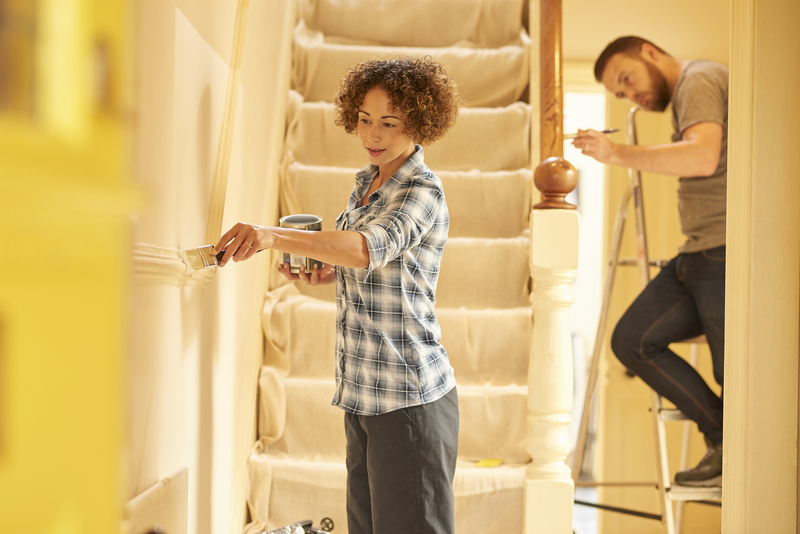 From painting walls to deep cleaning carpets, and refinishing floors and furniture, there are plenty of indoor projects that can still be completed in colder months. The problem is, cold weather makes it more difficult to complete these projects with doors and windows open for air. This means we’re more likely to trap fumes from the potentially dangerous chemicals in cleaning and home improvement products in our homes. If you’ve found that your home needs a little work before the holiday season approaches, there are several natural alternatives to standard cleaning and home improvement products that you can use to ensure your home is safe for yourself, your family, and your pets while you work. I have a few recommendations of my own that I picked up during my crash course in eco-friendly home improvement after becoming a new homeowner last fall. Hopefully these will help you out as you make indoor home improvements this year! As much as we’d like to avoid bleach products all together, it can be difficult to deny their incredible power when it comes time to complete tough jobs like cleaning stubborn stains in your white sink or bathtub. The good news is there are alternative bleach products you can either make on your own, or purchase to brighten up your kitchen and bathroom without trapping bleach fumes in your home. Making your own alternative bleach only requires lemon juice, baking soda, vinegar, and citric acid. If you would rather purchase a safer bleach product, look for chlorine-free options like Green Works or PC Green bleach. VOCs, or volatile organic compounds, are used in most paints. Experts say that VOC-heavy paints often include toxic materials like toluene, xylene, methylene, chloride, and formaldehyde that could put you and your home at immediate risk after you’ve opened a can. Fortunately, there are low and zero VOC paint options available to make painting a bit safer for homeowners. For winter projects that will predominantly involve work indoors, I recommend working with a zero VOC paint – these include no measurable VOCs. If you haven’t already worked with non-toxic zero VOC paints, check out Treehugger’s guide to zero VOC paint types and brands to find an option that best fits your project and individual needs. If you’ve enlisted the help of a regular exterminator but still find that you have issues doing away with seasonal pests like boxelder bugs and aphids, you might be tempted to use harsh repellents in between treatments. One eco-friendly pest repellent solution I’ve found to be extremely useful in my home in addition to regular pest control service is ultrasonic pest repellents. I did my research and found plugin pest repellents with good reviews and ratings after I noticed a boxelder bug problem toward the end of the summer. I purchased the Crave Greens plugins off of Amazon and haven’t had an issue with boxelder bugs since I plugged them in. I recommend checking out reviews and reading descriptions carefully for different brands and devices to make sure you get the most effective plugin for your specific needs. An eco-friendly, water-based wood stain can provide the same quality flat finish as a standard stain without exposing your home to harsh chemicals like those found in VOC-heavy formulas. Natural wood stain options use things like soybean or recycled whey protein to effectively stain furniture, floors, patios, and other wood structures safely. Eco-friendly stains can be a bit tougher to find than other eco-friendly home improvement products, but it’s definitely worthwhile to do your research and find one that fits with your project to spare your home from harsh chemical fumes as you work on your home this season. If you need a little help identifying eco-friendly stain options, Apartment Therapy has created a list with some excellent stains for environmentally-conscious homeowners. Green cleaning pros say that conventional furniture polish contains harsh chemicals that could potentially cause ill effects to human health and surrounding environments with long-term exposure, even if exposure only consists of small amounts. This is because hydrocarbons like formaldehyde which can cause serious harm to humans and the environment are often used in standard polishes. To avoid overexposure to the chemicals found in most polishes, use a natural oil-based formula that relies mostly on the conditioning powers of an oil – like coconut oil or jojoba oil – to clean and shine surfaces. Everyday Roots has an article that provides step-by-step instructions for making your own wood polish and sealant out of things like olive oil and beeswax. The same guide also recommends using plain coconut oil to polish your furniture if you don’t have the time to make your own. Preparing your home for the holidays is never a simple task. Adding on the responsibility of finding and purchasing products that won’t expose your home to harmful toxins certainly doesn’t make it any easier. Hopefully this guide saves you some time by providing you with the information you need to make the process of purchasing and/or creating safe products as simple as possible.